The BetIslands scandal is a perfect scenario of how money brings out the worst in people. It shows their true colors, and how much integrity and self-worth they may or may not have. Unfortunately, a lot of bettors were impacted by this scam. By the times things were said and done, more than $1.5 million was owed to players. Most of them were posters on a sports betting forum called Sportsbook Review (SBR). Weird, huh?! Does that sound like a coincidence to you? That sounds like an inside job to me. Like one of the oldest, largest and self-proclaimed industry ‘watchdogs’ sold their members out for a few bucks. But maybe I just have my tinfoil hat on? I’ll leave that for you to judge. BetIsland was owned by Jon Kreta. Based on the information I gathered he’s a young, 20-something year old, kid. In terms of major players, you can also include the key guys at SBR, including John, Bill Dozer and Justin. Not only did they pimp BetIslands out, they also covered up any connections between BetIslands and it’s lowly rated sister companies, EzStreet and 7Red. I would venture to say that BetIslands was just one large scam. They started off with an average rating – a C-, back in March 2011. In less than a year they were rated a B. Then for a year things appeared to be ok. And then all of a sudden they had no money, were insolvent and went from a B to C, then to an F. Players were collectively out $1.5 million. So their ‘scam’ was keeping/spending players’ money, and not keeping any of it on hand to honor withdrawals. Then they closed overnight with no explanation, or money to pay players back. This scam was a group effort. Each player or group leveraged their trust to encourage players to sign up to BetIslands. Lets look at each group – I think you’ll see what I mean. 1. Jon K. had a (relatively) good reputation from when he worked with WagerChief. He apparently quit (on good terms) soon before BetIslands started to pick up steam. Between that, the promos and shills pimping out BetIsland, that attracted many new players. Dozer than decided to pour salt into the open wounds of SBR posters by posting this response to a post related to BetIslands. Dark Horse, IMO time to man up take responsibility for the fact that you didn’t play at the safest sportsbook available to you. A lot of players made a lot of money with BI. Even those with the biggest balances were well into the plus column. When SBR told posters they weren’t rated higher because they were new, many of the same posters who are the loudest now, advocated that they were better than our opinion. So despite being the outfit that drove most of the business, without a really good reason why, and being a contributor to a $1.5 million dollar scandal, SBR didn’t even consider apologizing. Just that players ought to take more responsibility for their actions. So what can you learn from this? Well, assuming that most of the players at BetIslands came from SBR, I would say that you should be weary when a self claimed watchdog quickly boosts a book’s rating. You should also consider their history, and whether they’ve done the same thing in the past aka BetCascade. More than that, though, I wouldn’t just take recommendations from one review portal. Do your due diligence, ask your peers and perform some research on the company you’re considering signing up to. Then, and only then, should you whip out your credit card to place a bet. Can SBR be trusted as a review portal? Well Sports Betting Online say, yes.. and no . They have a tainted reputation on many separate occasions and have been accused of taking lump payments to boost less than safe books in the past. Are BetIslands Still In Business Today? No. BetIslands went out of business in 2012. 7RedSports and EzStreetSports still appear to be taking customers, though. – Connection to other shady books – Discussion how BetIslands is connected to EzStreetSports and 7RedSports. – The rise and the fall – You can see how quickly BetIslands rose through the ranks, then fell on it’s face overnight. – Sleeping with the enemy? Ask The Bookie discuss how SBR was in bed with BetIslands, including the database list they came across that shows their affiliate account. – It’s the players fault! – Bill Dozer’s unapologetic response. – Who can you trust? 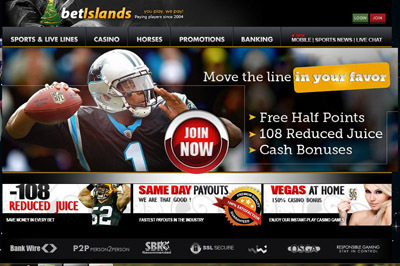 – Sportsbettingonline.net ask who you can trust in the future in relation to review portals.